The work on the book, The Most Famous Ice Rink in the World, started in earnest towards the end of August 2015 although it had begun as the seed of an idea a number of years before. Jayne Torvill and Christopher Dean were contacted and agreed to write the introduction. This was really appreciated as they trained at Richmond Rink in the 70s and the 80s, sometimes with Betty Callaway. Professor Jeremy Hamilton-Miller has been researching the history of ice skating and skating in the borough for some time and he followed on with an article of the years leading up to the opening of the rink in East Twickenham. Many local residents who spent years of their lives skating at Richmond Rink added their memories from as early as the 1930s up until the rink closed in 1992; those who were children at the time, teenagers, ice hockey players and ice skating coaches. Some were members of families who had a history of two or three generations at the rink. We also had contributions from the Honorary Historian at the National Ice Skating Association of Great Britain and Northern Ireland, an international judge and champion skater and two ladies who are now in their 90s. The photographs show fantastic skating feats including those of international champions, all from the rink in East Twickenham. One photo shows a 2000lb unexploded bomb which fell on the rink during World War Two, a little known fact, as it was quickly removed and the rink opened the next day. There are also paintings and sketches from two artists including Dennis Gilbert, a well known portrait painter and former President of the Contemporary Portrait Society, who sketched at the rink in 1956. David Daines, a member of the ice dance club, was there to photograph the demolition of the rink and Andy Sutch, the Chair of Sport Richmond provides an account of the time leading up to the closure of the rink. The overriding theme is that everyone loved Richmond Rink; people from all walks of life including the Queen’s children. Richmond Rink is part of ice skating history as well as Twickenham’s history. The memories live on; the names of Torvill and Dean and the legendary coaches Arnold Gerschwiler, Betty Callaway, Roy and Anne Lee are still on many people’s minds. 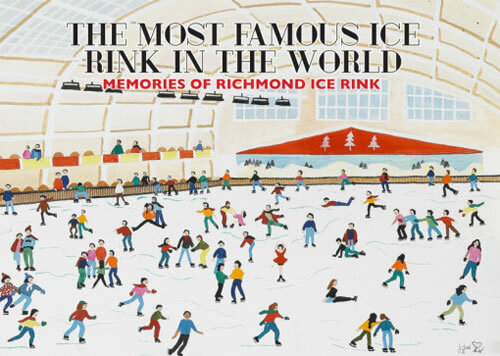 Richmond Rink must be the most loved ice rink in the world as well as The Most Famous Ice Rink in the World. For the last three years many of those who were associated with the ice rink in East Twickenham have come together to provide a temporary, community, ice rink in Twickenham. It is staffed by those who grew up skating in East Twickenham, managed by an international ice hockey player who has been honoured in the Ice Hockey Hall of Fame and the ice is tended by the same Zambonie operator who worked at Richmond Rink, even the well remembered ticket collector makes an occasional appearance. The temporary rink is visited by many local skaters and welcomes children who have the enthusiasm to skate just as thousands of children in Twickenham before them. Jayne Torvill, Christopher Dean, David Lane (publisher), Professor Jeremy Hamilton-Miller (REIC), Dixie Dean, Sandra Whiting, Gary Gibbs, Linda Smith, Dennis Clifton, Helen Strutton, Judy Joel, Elaine Hooper (NISA), David King, David Heath, Richard Buxton, Malcolm Lane, Gerry Swan, Chris Nelson, Roy Welham, Brenda Kelly, Joan Noble, Gladys Thompson, Dennis Gilbert, Roz Kadir, Jacqui Kamio, Johnny Stewart, Bob Holingshead, Diane Forrest, David Daines, Betty Coldman, Cllr David Marlow, Cliff Bradley, Sue Scott, Janice Newing, Lois Collins, Samual Viscardi-Smith, Karen Bayles, Lindsay Roberts-Warren, Glenys Swain, Dianna Ifill, Andy Sutch (Sport Richmond), Michael Bettes, Vanessa Riley, Douglas Orchard, Emma Matthews, Christine Shaw, Betty Hainey, Roy and Anne Lee, Julie Sheppard, David Heath, John Andrews, Jill Garrow, John Perry (REIC), [the late] Richard Meacock Teresa Read (REIC and Education and Resource Consultant) and Berkley Driscoll (REIC, Project Manager).